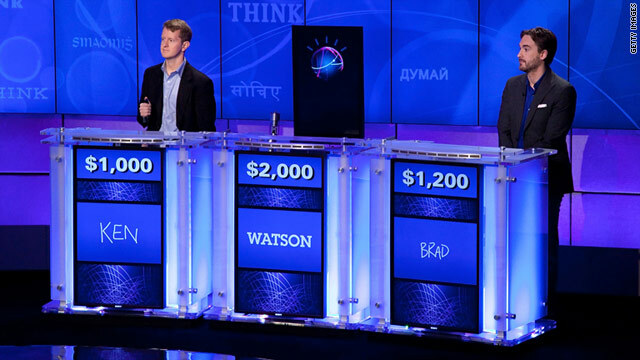 IBM held a practice round for its Watson computer, which will compete against people in an upcoming "Jeopardy!" episode. (CNN) -- His name is Watson. He's bad with puns. Great at math. And, next week, he will compete on the game show "Jeopardy!" against real, live, breathing, thinking humans. Smart ones, too. The "Watson" IBM computer, which has been in development for four years, will be matched against Brad Rutter and Ken Jennings, two of Jeopardy's champions. The episodes are scheduled to be aired February 14 to 16. Watson beat Jennings and Rutter in a practice round last month, during which the computer fielded about half the questions and gave all correct answers. To learn more about this man-versus-machine showdown, CNN spoke with author Stephen Baker, who's followed Watson's development and has an upcoming book, "Final Jeopardy," about what this question-answering computer means for the future of technology. CNN: In learning about Watson, what surprised you the most? Baker: I guess what surprised me the most was Watson's speed, because, when it started out, Watson took two hours to answer a "Jeopardy!" question, often incorrectly, and by the end they got it down to two to three seconds. You have to see this thing. Well the body of Watson, which is not on camera, is like 10 huge refrigerators, in an air-conditioned room. And then they've got this avatar, that is between Ken Jennings and Brad Rutter, that looks like a black computer screen with a revolving globe on it -- an orb. And then it has these lines -- they're supposed to sort of represent cognitive processes. Swirling images and things. So it's a bit deceiving -- what you see on TV? Yeah. It's just a simulation of cognition. Really it's just a big computer. As I say in my book, the avatar is a close cousin of the screen saver. Can you compare Watson to the machines we use every day, like a standard laptop? Watson has the power of a couple thousand laptops working together. And in terms of sophistication, it's a program that understands complex English -- or works mightily to understand complex English. And we don't have that in our laptop. What we have is Google. And with Google we work really hard to help Google understand what we're trying to communicate -- the two or three words we hope the computer will understand. Has it been able to accomplish something new with language cognition that other computers haven't? Or what's fundamentally new? As recently as four years ago, machines, in question answering, tried to take fairly complex questions that are similar to Jeopardy's and they got about 30% of them right, so they really couldn't do a job that was anywhere close to a human. Now Watson gets eight or nine out of 10 of the Jeopardy answers it tried correct. So it's just a huge improvement in getting a machine to answer questions. On a technical level, what did IBM do to accomplish that? Instead of just trying one approach, saying 'We're going to do it statistically' or 'We're going to teach the computer a million different rules about the world,' IBM just tried a very pragmatic approach, which said that if there's anything that works, we're going to include it in this. So they've got hundreds of different algorithms all trying a different approach to understanding the clue and trying to figure out the answer. And then it's up to the computer to look at thousands of different candidate answers and pick out the one that's most likely to be right. So it's kind of a throw-it-all-in-the-kitchen-sink approach? Definitely, because the one thing they have is massive computer power, so they can throw massive computing power at it. If I give you a math problem, you basically send it to the part of your brain that deals with math. If they give Watson a math problem, every one of these algorithms -- the ones that deal with poetry, the ones that deal with synonyms, the ones that deal with search -- they all go working on it. And many of them bring back ridiculous answers. But they don't care, because if the math algorithm brings back the right answer, they can decide on that and throw out the rest. So it's very wasteful. Are there certain things it doesn't understand? It has a harder time when it has to figure out multiple things in a question. For example, there's a type of "Jeopardy!" question that says, like "Do the math: _____ blind mice, times ___ Commandments equals this." So you have to say, 'OK, that's three blind mice, times Ten Commandments, so that's 30." That would be a lot of work for Watson. If there's a lot of puns -- it has trouble with puns. Language is so hard for it. It struggles with basic language, even like what you and I are talking about. And if they try and trip it up, they can succeed. What does this tell you about the future of computing? (Computers will be able to) understand us much better, not only when we're asking them questions but also when they're searching through all the words that we produce in e-mails and blogs and all the rest, and learn about the world. Machines like this are going to be able to go through all the data that we're creating and search for answers. Not like Google, which is searching for documents we might find interesting, but putting it together. Do you see this as a machines versus humans moment? That's kind of a contrivance because it makes for good TV. And it shows how far the machine has come, which is really impressive. But in the workplace, there's no sense in letting a machine work so hard to try to understand puns and things like that. People can do that. And they can benefit from what the machine does best, which is find stuff in massive troves of data -- find answers. Some people might look at this and be fearful -- as they see a computer that's getting smarter and smarter. Is there any part of you that's afraid of Watson? I think there's a concern for jobs that this type of computer is going to take away, because if you have a job that's based on understanding English and then searching for answers, if you work at a telephone help line for example, this type of machine is going to elbow you out pretty soon. It raises really serious questions about education and what we have to learn to make ourselves indispensable. Why did they name it Watson? It's the name of the founder of IBM, Thomas J. Watson. But it also is the Sherlock Holmes' No. 2., Dr. Watson. And it doesn't sound as threatening because people associate Watson as not the most intelligent guy in the world. What's in this for IBM? IBM does these challenges to advance computing and also to blow its own horn. And IBM has to compete for investment dollars and for brain power with other companies that are viewed as sexier, companies like Apple, Google, Facebook. And they want to let the brightest PhDs at places like MIT and Stanford know that IBM is a place to do really cool stuff. And they have this huge services division, which is their biggest division, and they want to use this technology to sell to their clients. They've done this kind of demo before, right? They were behind the chess computer, Deep Blue. And they also did Blue Gene, which was the fastest supercomputer at the time -- developed to decode the human genome. Do you think Watson will win? I know the result. I've written my last chapter already and it's being added to the book right now, so I can't say. But before the match I had some comments about why Watson, some said, had an advantage ... because it was one computer against two humans. Both of them would rather have had one human against two computers. Two computers would fight over the same sorts of computer specialty questions. What's an example of a question Watson would be really good at? The thing it just really eats for breakfast is: Give me a 14-letter word, ending in -le, that means whatever. Or take these 17 letters, what common nursery do they spell. So it just uses its computer smarts to do those sorts of searches very quickly. One area its very weak in against good humans is if the clue is short. If the clue is only a single name then ("Jeopardy!" host) Alex Trebek reads the clue, it takes him maybe only a half a second to read it, and Watson needs more time than that to search for it. So if you have a clue that says something like, the category is "first ladies," and the clue is "Ronald Reagan." Watson would need two or three seconds to come up with that answer and a good human would know it in a heartbeat, so Watson would lose every one in that category. Is this competition fair? Is it more than just an ad? Oh it's a real competition. I saw Watson in practice sessions throughout 2010, and it lost one out of three games to humans who were much less skilled than these two, that it's facing. So you'll see that Watson has enormous vulnerabilities.